Ryan Leonard is the son of Nick Leonard, who has been running the Speed Steel matches at Tri County Gun Club for ... well, the better part of the last decade. Nick has always been an extremely competitive shooter. He either wins, or he crashes and burns ... badly. There are no half-hearted attempts when Nick shoots; he always gives 110%, and he is always trying to win. Nick started Ryan shooting in competition when Ryan was about 10 years old. (Heck, he may have been younger.) Ryan learned to be as competitive as Nick, but had the advantage of starting earlier in life, and the further advantage of having a great coach. Nick always ensured the Ryan had good equipment, lots of practice, and the advice of a seasoned shooter. That would be Nick. That was as true for IPSC/USPSA competition as it was for Steel Challenge. In the past couple of years, as Ryan became even more proficient and self-confident, Nick may have focused more on Ryan's training and maturation as a competitive shooter than on his own competitiveness. Whatever the reason, Ryan has become one of the stronger young shooters in both disciplines. Keep your eye on this young man. When I saw them at the Dundee match last month, Ryan had grown in height, bulk and confidence. Since then he WON the Columbia Cascade Championship as an Open/Master Class shooter, coming in a comfortable 6% ahead the next closest competitor (also a Master Class shooter), and beating the nearest GM/Open shooter by 9%. 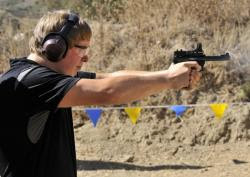 PIRU, Calif. - When the last shots were fired in the Steel Challenge's Open Rimfire pistol event, it was 17-year-old Ryan Leonard of Oregon City, Oregon, who outgunned the likes of Glock's Dave Sevigny, Blackhawk's Todd Jarrett and Smith &Wesson's B.J. Norris to claim the World Speed Shooting Championship title. Leonard posted the fastest score on three of the eight stages - 5 To Go, Smoke & Hope and Outer Limits - to finish in a final time of 69.76 seconds to edge out Team Glock's captain Dave Sevigny of Smyrna, Ga. by 1.45 seconds. Congratulations to both Nick and Ryan. I think you'll be seeing Ryan winning in Level III USPSA competition, too. Ryan has outgrown the local field, and should be ready to challenge the National Best in even more competitive fields. Speaker of the House Nancy Pelosi has suggested that people who voice opposition to the construction of a Mosque near the Twin Towers "Ground Zero" site should be investigated. "There is no question there is a concerted effort to make this a political issue by some. And I join those who have called for looking into how ... this opposition to the mosque is being funded,"
This is the first I've heard that someone wants this kind of investigation. But I only spend a couple of hours a day reading the news; apparently I have not been as well-informed as I thought. All I've seen are the comments from readers who have voiced opposition on the basis of the concept that 911 was not an attack on New York City, but on America ... and that in the minds of most Americans, "Ground Zero" has become as near to a Holy site as any which has been consecrated by construction of a religious edifice. Also, I've read a lot of commentary to the effect that this mosque (1) represents a "foot on the neck" of America, or a monument to the damage caused by the attack; and (2) that there must be some reason other than that which has been stated, to choose this specific site for construction of a $100 million Mosque. That last is especially curious, since New York City is said to already contain over 100 Mosques. But getting back to Pelosi: I wondered, when I read this, just WHO is going to run this investigation? Then I read this New York Times article (republished) titled: "Civilians to take U.S. Lead after Military Leaves". The article addresses concerns about how American support of Iraq will be continued as the Military Bug-out continues. Hmm ... the State Department. That would be Hillary Clinton, right? This extends HillaryCare to its logical absurdity. Poor Iraqis, relying on Hillary diplomats to keep them safe. You people are screwed. Screwed. So, is Hillary also going to be responsible for undermining both the American First Amendment? Will she be the one who investigates the protests which are obviously a grass-roots uprising? If so, Americans are screwed, too. What idiot let the State Department take responsibility for ... well for anything? A good president is one who keeps the Department of State firmly under his thumb. I know you can watch this in gigantic format on the original MSNBC link (see above), but I was impressed. Rep. Maxine Waters - It's Bush's Fault! Representative Maxine Waters has been brought up on charges from the House Ethics Committee on the grounds that she used her congressional influence for the betterment of OneUnited Bank ... a commercial enterprise in which her husband has a $350,000 investment. Her defense is that she wanted to resolve a 'general' lapse in governmental assistance to financial institutions, but the Bush Treasury Department was so slow in responding to her ... proposal that by the time they got around to scheduling a meeting only one bank showed up at the meeting. That bank was OneUnited Bank. When the meeting was held, OneUnited was the only bank represented, according to the report. A lawyer for the National Bankers Assn. also was present. That, the Office of Congressional Ethics said, was "cause for concern,'' given that the National Bankers Assn. represented 103 banks, including two in the Washington area. Waters, one of the most Liberal congress-critters (and a representative from California), has called for the earliest possible hearings, so that she may state her case. She has also fallen into the political trap of ascribing ANY negative result from congressional intercession to the presidential administration of former President George W. Bush. As I said earlier: if I had known that there was so much HUMOR in national politics, I would not have attempted to avoid the subject, in recent months. .... it's always George Bush's Fault! "This Liberal would be all about socialisin .. uh ... uh ... basically .... taking over .... and the government would be running all of your companies." Yeah, like the government has done so well in the past couple of years running the country, let alone running an actual for-profit industry. As my friend Hobo Brasser has so often said (courtesy of Jimmy Buffett): "If we couldn't laugh we would all go insane." Rolling Stone reporter not allowed to "embed"
"The Rolling Stone magazine journalist whose article about Gen. Stanley McChrystal helped end the Afghanistan commander's career has been denied permission to embed with a military unit in Afghanistan, a Pentagon spokesman told CNN Wednesday." The writer was obviously, disappointed. It appears that he thought his career plans had been unfairly undermined by the Pentagon decision not to 'embed' him with a military unit in "The Sandbox". Interesting article, you may wish to read it. Hastings is right, there is obvious aversion on the part of Military commanders in a War Zone to accept him as an "embedded correspondant". One wonders why? Could it be that his last series of interviews with our fighting men and women resulted in the relief from command of one of the most successful Generals of the entire Middle Eastern Command? The cited article includes segments of a Larry King interview. One memorable quote was when Hastings said: "If the White House had wanted to 'sweep this thing under the rug', they could have done that". Sure. The article was published in a popular American magazine, and was clearly critical of the President's military decisions. Another question from King was: "What do you think is going to happen to him (McCrystal), Michael?" Hastings' answer: "I'm not sure, I think he's going to open a book store ...". General George S. Patton made many comments critical of the current administration during WWII. He was counseled by his peers and military superiors against such intemperate comments, and was (for a while) relegated to posts which were not on the Front Line of battle. But he never was treated to such an ignominious dismissal. I, for one, am glad to hear that Hastings will not be reporting the "War News" At this time, it's not clear whether his career has been embellished or tarnished by this article. We can only assume that it has been embellished for his 'fearless determination to print the truth', no matter how much his perceived 'truth' has damaged current Military efforts in the Middle East. But there's no obvious reason why current Military Commanders should readily agree to accepting Michael Hastings as an "embedded correspondent". The man (Michael Hastings) is a quisling, nothing more and nothing less. His technical skills as a writer are immaterial in this context. For now, he is the 21's Century's equivalent of Lord HaHa. "Embeds are a privilege, not a right. The unit decided they didn't feel the trust necessary for an embed. They declined,"
I've tried hard -- so very hard -- to minimize the amount of political commentary here. This is suppose to be about "shooting sports" and cultural issues. Please understand that the following photo doesn't fit either of these categories. It's just so darn funny I almost spewed a sip of decent Canadian Whiskey Ice Water on my keyboard when I saw it. It's included here strictly for its HUMOR value. The funny thing, judging by the 'other' sign seen in the picture, is that this seems to be a protest rally organized by "ANSWERcoalition.org" Which is a group of folks who ... judging by the sidebar articles on their website ... are decidedly, uh, "Liberals". Well, then that makes it all right, doesn't it? If I had realized that Politics involves so much humor, I might not have been so diligent about censoring the Political aspects from this blog. "Sometimes a fool makes a good suggestion." "They Also Serve, Who Only Sit and Wait"
This video is featured today for Sgt. Adam, his father Bill, and all their combined family. And for my family, and for my Son's family. And for all the family and loved ones of those men and women who have put their life on hold while they serve their country. It's one way of saying "Thank you for your service", and "Welcome home!" It's ten minutes long, and I suggest you close your door while you watch it. If you don't like "Schmaltzy" videos that make you feel ... human ... maybe this isn't for you. Too bad. You should go see your doctor. Maybe it's a vitamin deficiency.